The online CEED registration process has started for the academic year 2015. The CEED (common entrance examination for design) is a qualifying examination for admission of the Master of Design (Master of Design) programmes at the IISc Bangalore, IIT Bombay, IIT Delhi, IIT Guwahati, IIT Hyderabad, and IIT Kanpur and PhD programmes in design at some institutes. 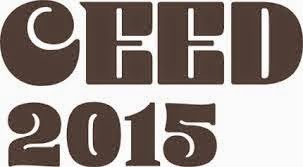 The CEED is usually held every year and it is conducted by IIT Bombay. The CEED examination will be held on December 07, 2014 this year. The CEED examination consists of two parts namely Part A and Part B. The candidates have to attempt the questions from both the papers. Part A consists of multiple choice type (MCQ) of questions which one clears gets to the second level of examination. The second level of examination consists of the design and hand drawing type of questions. The answers to the Part A questions will have to be given as one of the choices in the computer. The answers to the Part B questions will have to be given in the answer book by the candidate which is provided by the invigilator. These answer books will be collected for the manual correction once the examination gets over. The part A consists of the screening test for the candidates to get to the second level of examination. The second level of test is known as design aptitude test (DAT) whose score is important for the candidate to get enrolled to the interview process. If n is the total number of seats available in the desired institutions, then approximately 10*N top candidates will be selected from the part A. The Part B will be evaluated for the candidates who are only selected and shortlisted from part A. The scores from Part B will be used as the qualifying score for the interview process. The merit list will be made available to the candidates who are shortlisted in the Part A and Part B. The exam pattern for the CEED examination is given earlier for the examination. The answers for the first screening test will be given by the candidate as one of the multiple choice answers in the computer itself. The examination is a multiple choice question in the computer. The online examination is supposed to be initial first screening test for the candidates. The part B will be evaluated by the invigilator by way of manual correction which is to be written in the answer sheet by the candidate. The answer patterns for the previous year question papers are available in the website. The students can broadly recognise the syllabus from the previous year’s question papers. Kindly post your replay for "CEED exam pattern and answer pattern"